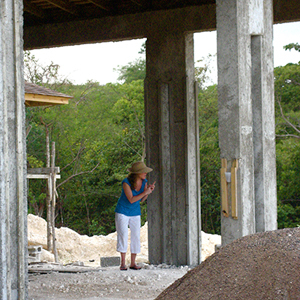 The author on site in Jamaica. When I was on vacation last week, I indulged in one of my favorite guilty pleasures …the unauthorized house tour (credit for the name goes to my architect boyfriend). You know you’ve done it… waited until the contractors left and snuck into the new house being built down the street to see what your neighbors are up to. It truly is a great American past time. Off-season in places like Martha’s Vineyard you can even sneek around and get a peek of all those finished houses you saw published but wanted to view in person. In the middle of February they are a lot easier to find without pesky foliage getting in the way and no one is around! Don’t go alone… it is more fun to have someone to share your design opinions with (“That counter treatment is sooo ’90s!”) … and it is a good idea to make sure there is someone who can call 911 when you fall through the floorboards. In this case, we were “analyzing construction methods in the Caribbean and how they differed from the States” (yeah right) and our method of escape was a golf cart that topped out at 12 mph… but this all added to the sense of adventure!